Is Japan In Danger Of A Deflation Relapse? "Japan’s V-shaped recovery has now become a statistical fact rather than our forecast. According to retail sales statistics, the level of retail sales in June has already exceeded the level prior to the disaster. Sales of general merchandise and apparel have recovered and replacement demand for vehicles and reconstruction demand for household equipment have lifted sales of these items to above their levels of February". Takuji Okubo, Societe Generale (see note below). 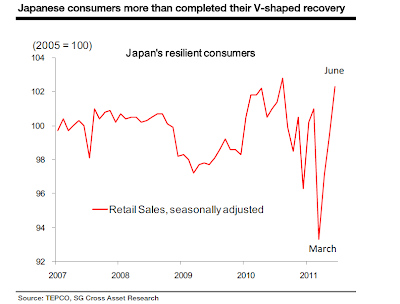 Is Japan really, as Tukuji Okubo suggests, having a "V-shaped" recovery? On some measures this assertion would be hard to justify, but then, at the end of the day, perhaps it all depends what you mean by "V-shaped" and what you mean by recovery. Obviously, as he suggests, retails sales have just bounced back to a point above where they were when the tsunami hit (see chart below), but look what had been happening to them in the months prior to the disaster. 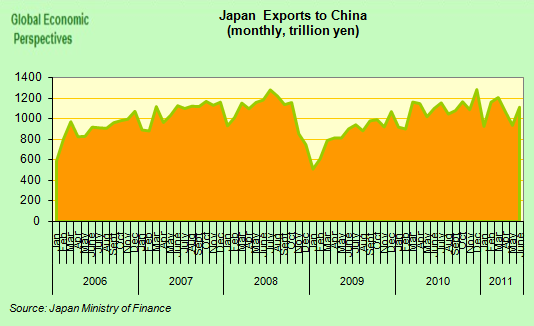 Sales had been losing momentum ever since mid 2010, as had the rest of the Japanese economy. It is well worth reminding ourselves at this point that Japan entered recession (that is had the second of 2 quarters of eceonomic contraction) in the first quarter of 2011 because it had already contracted in the last quarter of 2010. So evidently it is not so hard for the economy to recover to its February point of departure. The more interesting question to ask might be what happens next? 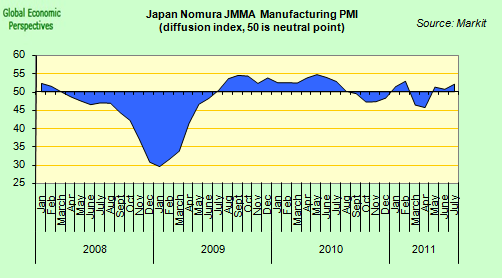 If the economy was weak in February, and a global slowdown is now in the works (a slowdown with a financial dimension which exerts constant upward pressure on the yen), then at some point might the next move not be down rather than up? 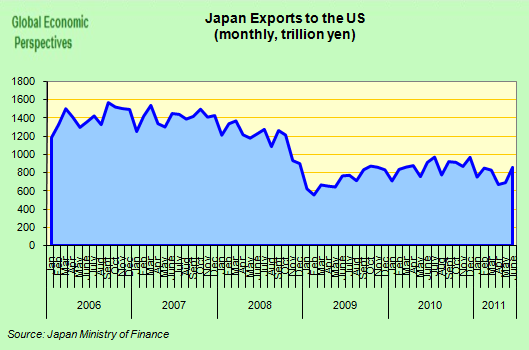 As we know, Japan's is an export dependent economy, so more than retail sales it is external demand that matters, and as we also know global demand is slowing at this point, which makes things more, and not less, difficult for Japan. Industrial output has recovered to some extent, but in June it was still 5% below the February level, and nearly 16% below the pre-recession high. 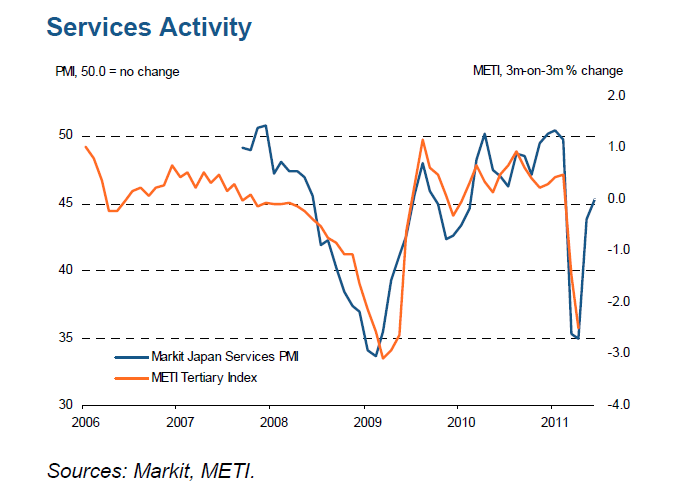 And while the July manufacturing PMI showed that the sector continued to expand, the expansion was only moderate. More significantly new export orders fell for a fifth successive month, with survey respondents mentioning the fall in China and the US in particular. And if we look at the present level of Japanese exports, we can put this "V-shaped" recovery in some sort of perspective, since in June the level of exports was down 19% from the June 2008 level (ie the level of 3 years ago). 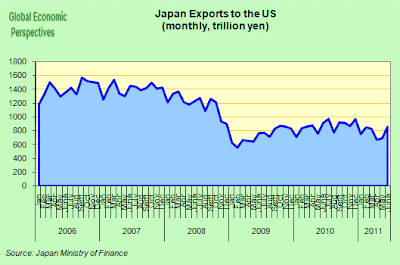 Exporters are dependent on demand for their products elsewhere, and as we can see, demand for Japanese products in the US has remained well below the pre-crisis level. We find a similar picture as regards exports to Europe, and it is evident that the problem goes back well beyond the recent natural disaster. 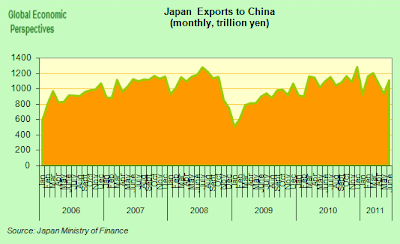 More worryingly, exports to China are now stagnating, and here the issue is clearly not absence of potential demand (since German exports to China have been booming) but price, and the recent high values of the yen. 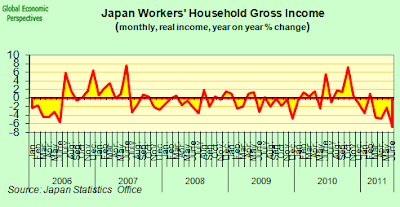 While gross income in worker households was down 6.7% over June 2010. 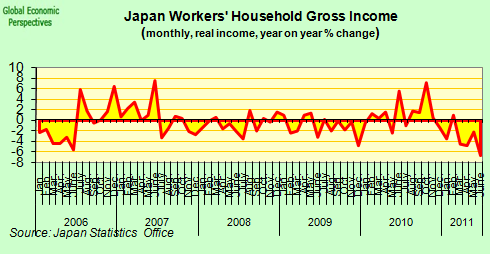 So there is still a long way to go on the income side before we can expect a real deman recovery. 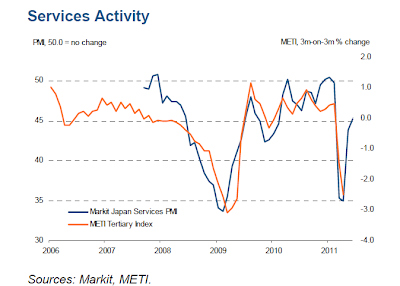 The broader weakness in consumer spending was also revealed in the June services PMI, which once more showed quite strong contraction. 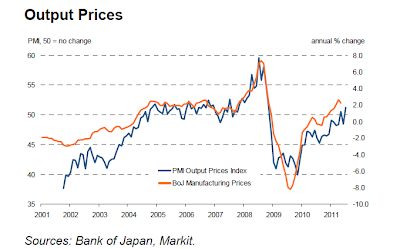 Which brings me back to the main point of this post, what are the dangers of Japan slipping back into deflation at this point? 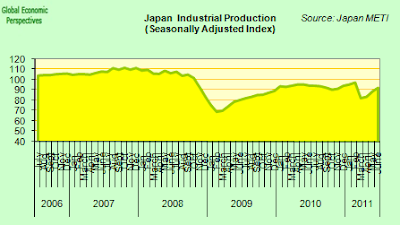 The Japanese price indexes had, as was the case in 2008, being moving back into positive territory interannually on the back of the surge in commodity prices, but now, with the global economy slowing, there are clear signs that inflation is heading down again, and the ex-food and energy register only rose 0.1% over a year earlier in June, which is to say by September/October we could easily be back in negative territory again. 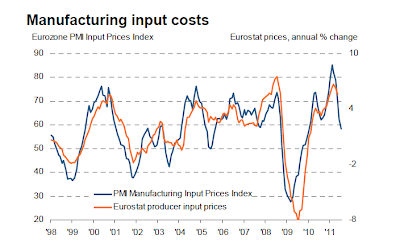 This view is reinforced if we look at the price component in the manufacturing PMI, since while input costs were again up sharply in July, they rose at the slowest pace in six months. On the other hand the survey found that the rate of output price inflation was only modest, since capacity issues and competitive pressures continued to restrict firms’ pricing power. 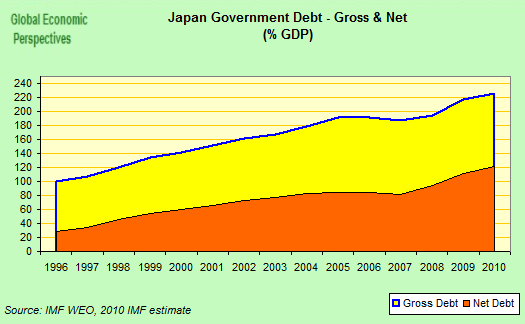 As will be remembered, deflation represents a serious problem for any country with a serious sovereign debt problem, since weak economic growth and price declines can mean sustained periods of nominal GDP shrinkage which simply sends the level of debt to GDP spiralling upwards, as we can see has happened in the Japan case. For many this problem in Japan is benign, since domestic Japanese savings finance the debt, and this may well be the case for as long as Japanese home bias and the current account surplus can be guaranteed, but if either of these things go then the rate of interest which might need to be paid to attract capital could quickly make the debt dynamics unsustainable. 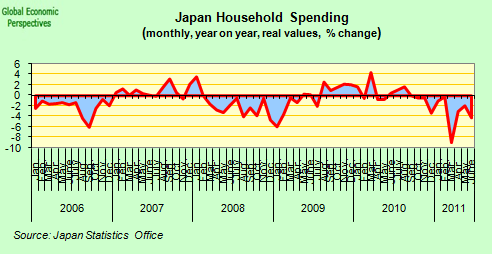 Simply put, Japan cannot afford to "normalise" in the sense of having "normal" rates of interest and low inflation, and this fact alone should be worrying people. 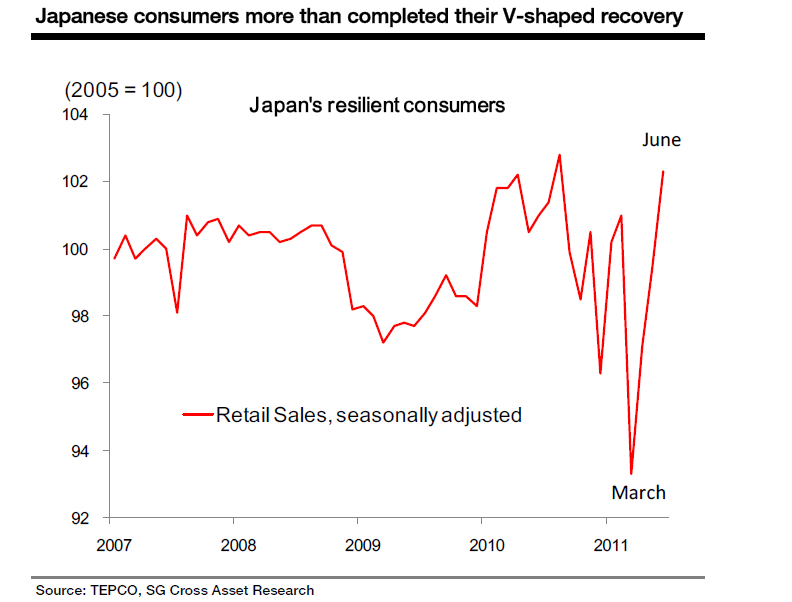 Which brings us back to the starting point in the present piece: the "V-shaped" recovery in Japanese retail sales. While attention this week has been largely focused on debt sustainability in the United States, it should not escape our notice that Japan’s government chose the end of last week to make public plans to spend a minimum of Y19,000bn over the next five years and up to Y23,000bn over the coming decade in order to carry out the reconstruction of the disaster-struck north-eastern coast. There was, however, one deeply significant detail about the plan as presented, and that was that no information was provided on how this pretty significant increase in spending was going to be paid for. Despite earlier speculation no information was included on tax increases which might be implemented to fund the spending. It seems no agreement was possible within the ruling Democratic Party of Japan on the issue. Earlier proposals had called for emergency tax increases of about Y10,000bn ($130bn), including an increase in income tax and a rise in corporate taxes, to fund reconstruction. But fierce opposition to such tax increases from within the ruling DPJ is said to have made agreement on this impossible. Just as significantly, little progress has been made on the proposal to increase the consumption tax (currently 5%) in order to reduce the mountain of debt, which is perhaps not so surprising since evidently such an increase would quickly bring to an end the current "V-shaped" surge in retail sales. 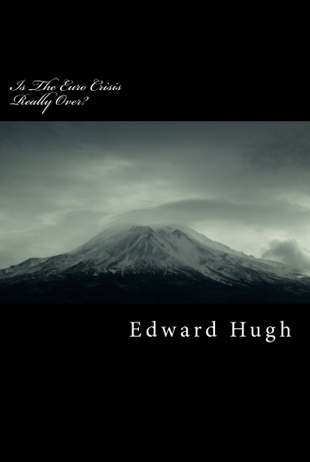 All in all, the phenomenon is very reminiscent of something which is currently going on out there, over on the other side of the Pacific, raising the possibility that the United States may not the only non-European country currently running the risk of having a credit downgrade in the non too distant future. NB, I certainly wouldn't like it to give the impression that I am in any way singling out Takuji Okubo for special criticism here, his report was simply the first I read, and the argument caught my attention, in fact his optimistic assesment of the Japan situation is pretty widespread among bank analysts at this point. The argument advanced in my post is simply an extension of what I have been arguing since the tsunami tragedy hit the country. 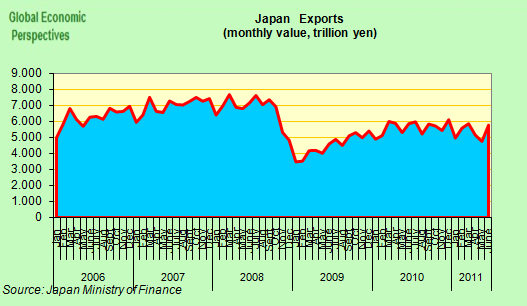 See Japan’s Economy Struggles For Air (May 6th, 2011) and "Surely There Is Nothing “Funny” About What Is Going on in Japan?" (March 21st, 2011). The Hungarian government’s much publicised unorthodox plans to cut the country's public debt level has been attracting a lot of attention of late, both from the media and from the rating agencies. Some observers have been quite positively impressed. Fitch Ratings, for example, raised their outlook on Hungary’s sovereign credit rating in early June from negative to stable, citing government plans to reduce what is currently the largest accumulated public debt among the European Union’s eastern members. Others, however, continue to have their doubts. Moody’s, for example, has decided to maintain a negative outlook on the country's due to concerns about the general trend in government policy, and the possibility of slippage with deficit objectives. Either way, these are changes within very defined margins, since at the end of the dat Fitch currently still rates Hungary at BBB- and Moody’s at Baa3, in both cases these ratings amount to the lowest investment grades. Nor are the analysts any more unanimous. Christian Keller, head of emerging Europe research, Barclays Capital, feels the most challenged of the CEE economies have now gotten over the worst, and could now serve as role models for their Southern counterparts. Capital Economic's Neil Shearing does not agree, and warns that those who suggest that emerging Europe will avoid contagion from the South could “prove to be being dangerously complacent”. On the other hand Market sentiment seems to be much more with Fitch than Moody's so far, since, as I highlighted in this post, Hungary's CDS are now well below the highs of over 400 seen as recently as last November in the wake of the Irish crisis. Arguably though the much maligned Moody's have their finger more on the pulse in this case, since the way Hungarian risk is being treated by both Fitch and the CDS seems to reflect pretty optimistic assumptions. 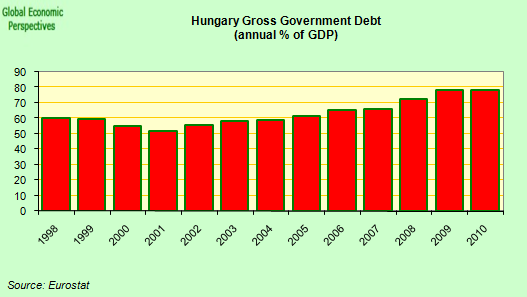 Not only is Hungary is the East European country with the highest gross government debt to GDP levels (around 80%), it also has very high gross foreign debt (around 135% of GDP, of which 45% is forex denominated), and it is a country where institutional quality is a constant cause for concern. 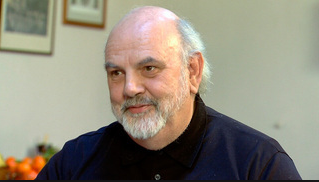 The most glaring recent example of this is the decision to unilaterally liquidate the formerly mandatory private pension pillar, and recover the accumulated reserves for the coffers of the state system, a measure which at a stroke took 9% of GDP from the accumulated debt, and a lot of short term pressure from the deficit. Yet since the pension liabilities remain however you account for them, this is simply another kicking the can down the road move, and not a real example of a positive saving. Indeed it is the predominance of this and other similar "one off" measures in the Hungarian debt stability programme which worries not only Moody's, but also the EU Commission and the IMF. "Central and Eastern Europe has remained fairly immune thus far from contagion, as financial stability and solvency among euro area peripheral countries as well as some quasi-core (Italy) countries have lately taken centre stage. 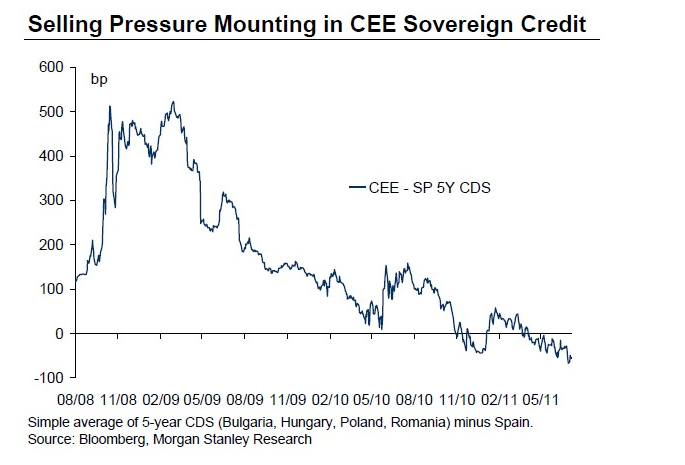 One can argue that CEE has benefited from 'benign neglect’ on the part of investors, who focused their attention elsewhere. However, this fragile equilibrium is not necessarily going to hold,"
To some extent the scale of the debt in relation too its peers makes the country look very much like the Italy of the East - since 2006 the country has suffered from stubbornly low growth, the scale of the challenge involved in bringing about a real reduction in the sovereign debt has been consistently underestimated, and one administration followed by the next has relaxed in the comfort of continually rose tinted GDP growth forecasts. 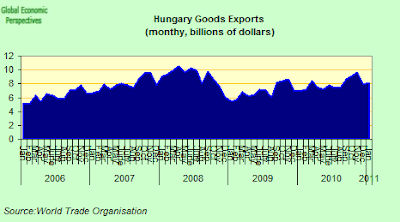 But when we come to examine things in the cold clear light of detailed macro economic scrutiny, apart from the presence of a strong trade surplus there is not that much to commend in Hungary's recent economic performance. 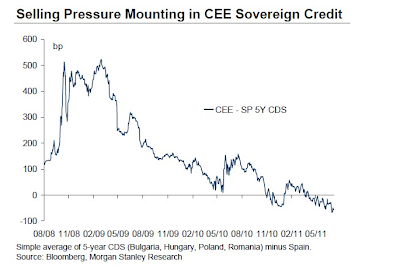 So even though Hungary's CDS and other risk measures have gradually fallen back in line with the regional pattern, we might well ask ourselves whether this will not be yet another case of a decoupling that wasn't? 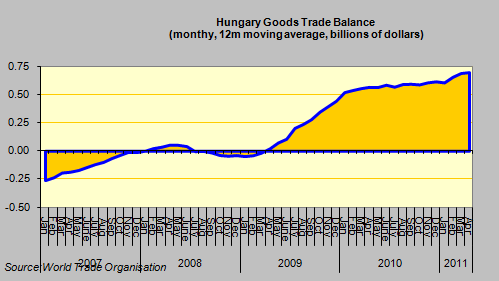 But let's get things off on the right foot: not everything in the Hungarian economy is going badly. In the first place, and above all, exports are booming. 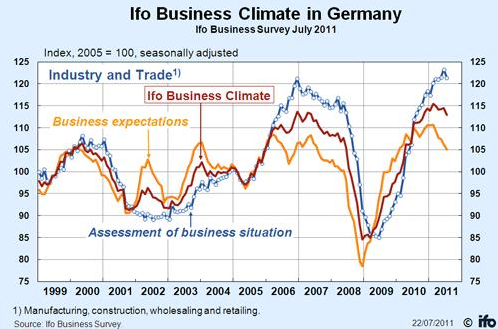 Growth has returned to the economy, following a peak to trough fall of over 7% fall during the financial crisis. 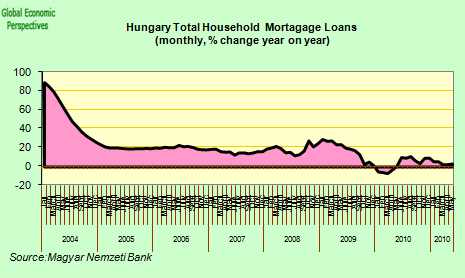 So that was the good news, what we might call the Hungarian success story. But unfortunately the story doesn't end there, there is more. The apparently positive picture highlighted above conceals another, much more problematic and preoccupying one. 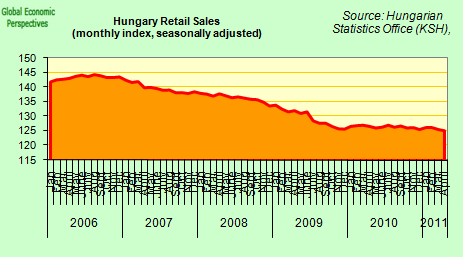 Despite all that recent growth Hungarian GDP is still substantially below its pre-crisis peak. Indeed it is so far below that it remains at a level which was first attained at the end of 2005. That is to say, Hungarian GDP has effectively stood still for the last six years. 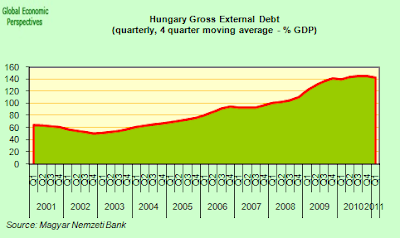 But while GDP has been marking time back there in the middle of the last decade, Hungarian debt certainly hasn't been standing still. Officially recognised government debt reached around 80% of GDP in 2010, and while it may not rise significantly in the short term, this is both well above the 60% level the country needs to gain access to the Euro, and well above public debt levels in most of the country’s regional peers. The critical question is whether the policies being currently pursued will be able to bring that level back down again, or is Hungary, like Italy, in a knife edge situation where if growth and inflation are not sufficiently high, and interest rates begin to climb if risk sentiment turns against the country, the debt will start to climb upwards in a way which will be hard to control? One of the factors which is sure to make it hard to achieve those ambitious government growth targets of 3% in 2011 and 3.3% in 2012 is the state of domestic demand, which is now in continuous decline on the back of a falling population and a significant credit squeeze produced by a heavy dependence of CHF borrowing. In fact retail sales have now been going down since mid 2006. They continue to fall, and it seems pretty unrealistic to imagine that this trend will now be reversed. 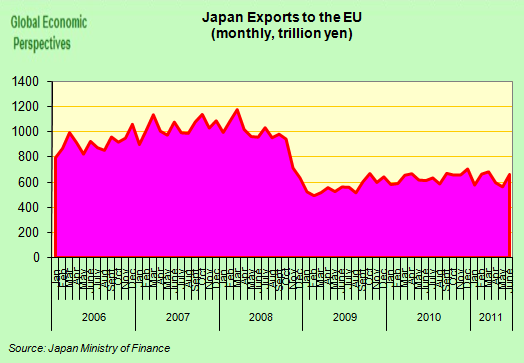 Which is why the strong trade surplus is as much a product of a slump in imports as it is of booming exports. Private sector credit is effectively stagnant. Even the small apparent interannual rise in the value of outsanding mortgages shown in the chart below is a little deceptive, since the increase is almost all accounted for by the rising value of existing Swiss Franc mortgages (pushed up by the value of the CHF) and there is little if anything in the way of net new mortgage lending. Which means the construction industry has entered what is now a rear terminal downsizing state. The industry is now only half the size it was at the start of 2006.
the face of the future can be seen from the level of indebtedness. While GDP, housing starts, car sales etc have all fallen, the one thing which has just kept growing and growing is the size of the country’s gross external debt, which stood at 135% of GDP at the end of the first quarter of 2011. 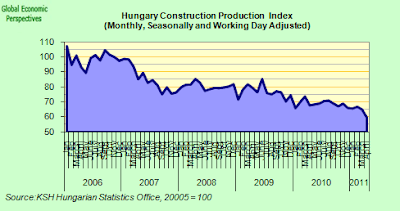 The recovery in the Hungarian economy remains weak due to a lack of domestic demand. 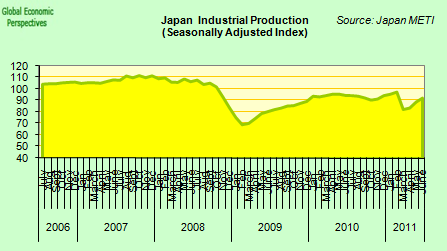 After falling 14 percent in real terms in the 12 months to mid-2009, domestic demand has remained essentially flat. Still high unemployment, muted wage growth, falling consumer confidence, and stagnant credit are weighing on consumption. Meanwhile, fixed investment continues to decline amid considerable idle capacity, bottlenecks to credit supply, limited final demand, and an uncertain business environment. Recent data underscore concerns about the recovery: retail sales growth remains flat in early 2011 while the rate of decline in fixed investment actually accelerated in Q4 2010. Such weak demand has kept a lid on underlying inflationary pressures, while private real sector wage growth remained at historic lows. The key points I wish to make in this post are as follows. - There is a substantial contagion danger due to the current mispricing of risk, and the possibility of a sudden correction. - There has been no real recovery in domestic demand, which means the country has to rely on exports, and this becomes difficult during a time of rapid economic slowdown elsewhere. - The large proportion of external debt makes it difficult for the country to volutarily devalue, and indeed since 45% of government debt is non-forint-denominated any slippage in the HUF only pushes debt to GDP upwards. - To avoid slippage the country needs to maintain a comparatively high interest rate policy (currently the central bank benchmark rate is 6%) which makes it hard to apply monetary easing to stimulate demand. 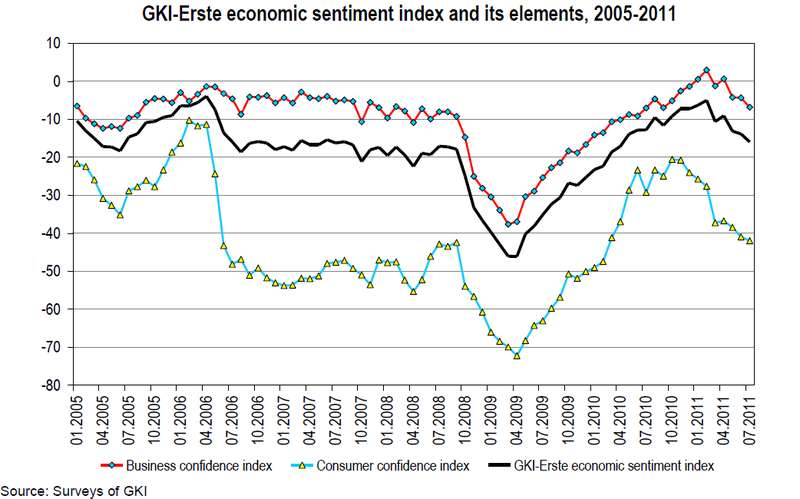 This cocktail - less GDP (in comparison with before the crisis), less people, a smaller workforce accompanied by higher (and potentially growing as political pressures mount) debt - is inherently unstable and quite unsustainable in the longer run, and especially so if financing costs start to rise again and exports wane during any forthcoming Eurozone crisis. The Convergence Programme identifies two scenarios: one is a cautious and conservative path in which the positive effects of the Structural Reform Programme are manifest late and not with full effect. The other is a dynamic path of growth that assumes the successful handling and management of existing bottlenecks. The probability that the actual implementation of the plan resides somewhere between these two paths is 80%. 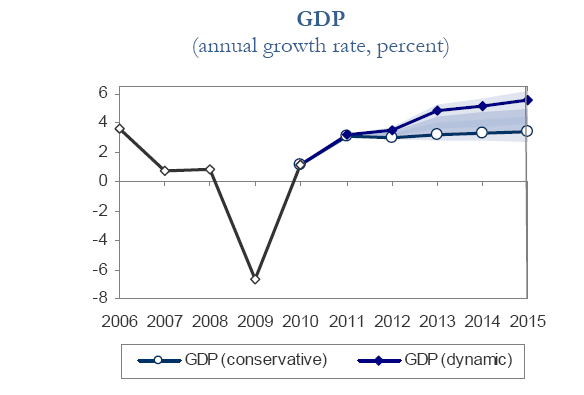 In the dynamic scenario the risk premium will decrease in the long term and due to the incentives of the New Széchenyi Plan investment will grow at a higher level than in the conservative approach. These effects enhance capital accumulation and labour demand at the same time, improving the household’s disposable income and domestic demand. 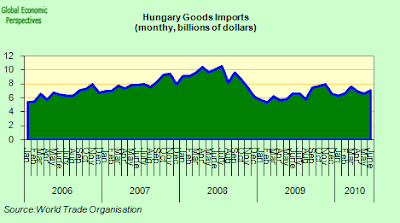 Under these favourable circumstances the Hungarian economy can grow at 4,8-5,5% in the period of 2013-2015. 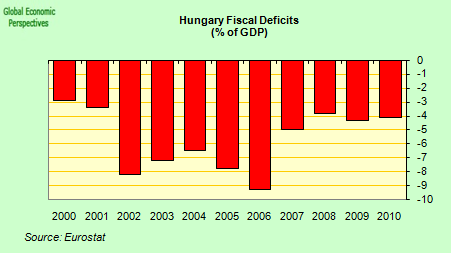 So the Hungarian economy could grow between somewhere between 4.5% and 5.5% between 2013 and 2015? With all the known problems the Hungarian economy is facing! On which planet are these authors living? Fortunately neither the EU Commission nor the IMF have been taken in. The EU Commission has really yet to pronounce on the longer term forecasts, but their shorter term growth expectations (at 2.7% in 2011, and 2.6% in 2012) are significantly below those of the Hungarian government, while the IMF outlook at 2.8%, 3% and 3.2% (for 2013/14/15 respectively) is much more in the land of the living, even if it still sounds rather optimistic. Then there is the political risk, which Moody's draw attention to. You provide your voters with hopelessly unrealistic expectations, then somehow or another you try to find a way to comply, which normally implies higher rather than lower budget deficits. This is a possibility to which the IMF is currently extremely alert. The 2010 general government deficit of 4.3 percent of GDP (ESA terms) exceeded its target by ½ percentage point— mainly at the local government level—despite a series of ad hoc corrective measures late in the year. This slippage implied a primary structural weakening of 1¾ percent of GDP in 2010, undoing much of the adjustment achieved during the 2008–10 Stand-By Arrangement (see the forthcoming Ex-Post Evaluation report). Poor budget performance continued into the start of 2011 where the first quarter central government cash deficit has already exceeded the government’s initial annual target, largely because revenues fell short of optimistic expectations. "The large amount of foreign-currency lending to households underpins the rating agency's expectation that asset quality will deteriorate further, as these borrowers' ability to service their debt has weakened significantly following more than 30% depreciation of the forint against the Swiss franc in recent years," Moody's Vice President and Senior Analyst Simone Zampa, the author of the report, noted. And the financing all that external debt represents another problem, especially as investors have taken more and more of it at shorter, and shorter maturities. As the IMF notes, financing the debt amortization schedule will be a particular challenge for the country in the coming years. 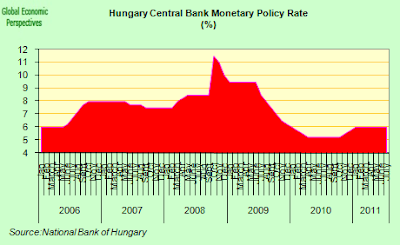 "Evidence is accumulating suggesting that the public debt reduction plan will prove much less than forecast, leaving Hungary more exposed to external vulnerability and failing to safely anchor the sovereign credit rating in investment grade territory..."This raises the question of whether Hungary’s fundamentals have improved enough to motivate a stable high foreign positioning and whether a further escalation in the Greek debt crisis will lead to a sharp sell off of the forint." So problems enough, and, as the IMF emphasise, it is important not to let the calmness of the current environment mislead, and produce complacency. 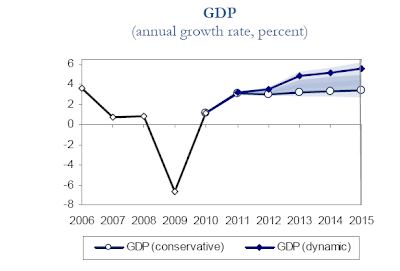 Fiscal slippages in 2010 and 2011 to date highlight the difficulty of translating policy intentions into results, particularly in the context of a still weak economy. In this context, the surplus in this year’s budget (which is entirely due to the one-off revenue effect of the de-facto nationalization of the second pension pillar) and the current benign market environment must not lead to complacency, especially in light of the electoral timetable and a challenging public debt amortization schedule after 2012. As Europe’s leaders struggle to convince markets that their Greek debt problem-resolution-proposals are actually viable, and will really do the trick, last week's flash PMI readings seem to have attracted rather less attention than they might. Nonetheless, the fact of the matter is that it is steadily becoming clearer that the current slowdown in Eurozone economic growth is turning into something more than just another one of those pesky “soft patches”. 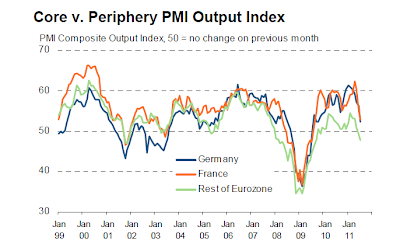 The pace of economic expansion in core Europe has slowed dramatically, falling back in July for the third consecutive month, according to the latest flash PMI. Commenting on the flash results Chris Williamson, Chief Economist at Markit said: “The Eurozone recovery lost almost all of its momentum in July, recording the weakest growth since August 2009 when the recovery first began. Excluding the financial crisis, the July survey was the most downbeat since the Iraq war in 2003, and consistent with a flat trend in quarterly gross domestic product. 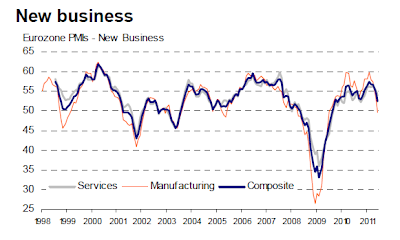 In fact the rate of expansion – the composite indicator registered just 50.8, only slightly above the dividing line between growth and contraction - was the lowest since August 2009, when the recovery was just starting out. 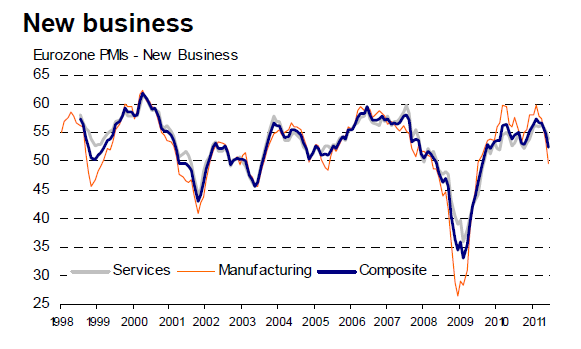 More importantly (for the longer term) new business coming in showed only a very marginal increase in July, registering what was the smallest rise since demand for manufactured goods and services first started to return to growth back in September 2009. Levels of incoming new business fell in manufacturing for the second month in a row, declining at the fastest rate since June 2009 – with new export orders actually falling for first time since July 2009. What this means, of course, is that the slowdown has now extended, spreading deep into the heart of the core, with both services and manufacturing in both Germany and France affected. 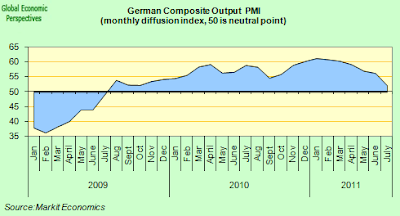 The German composite index fell to 52.2, from 56.3 in June, and while the latest reading still remained comfortably above the 50.0 no-growth value, the month-on-month index fall of 4.1 points was the largest since the November 2008 post Lehman drop. 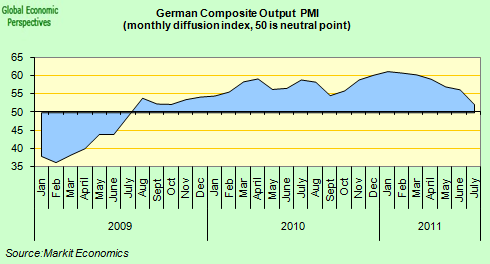 Tim Moore, Senior Economist at Markit said in his report “Almost in the blink of an eye, German private sector output has gone from rapid growth to a slow crawl. But even as growth in the core economies approaches stall speed, out on the periphery a new recession seems increasingly on the cards, and most importantly in countries like Spain and Italy which have so far managed to keep their heads just above the waterline. Growth in the second quarter of the year looks likely to have been minimal in both cases, and the outlook for the third quarter suggests we are entering a bout of economic shrinkage. The PMI readings also coincide with the impression offered by monetary indicators. 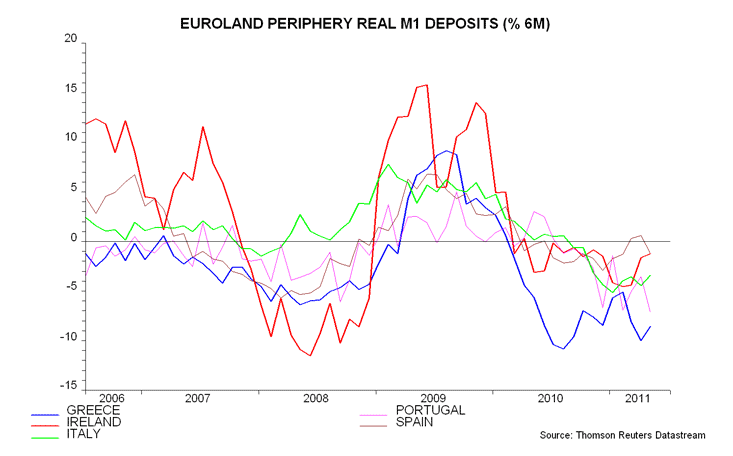 As Henderson Global Investors’ Simon Ward points out, in late 2010, while real (ie inflation adjusted) current bank deposits were contracting in Spain and Italy, they were still growing robustly in both Germany and France, implying a solid economic growth economic outlook in the core for the first half of 2011 (this monetary indicator is often thought to give an indication of activity with a 6 month lag). 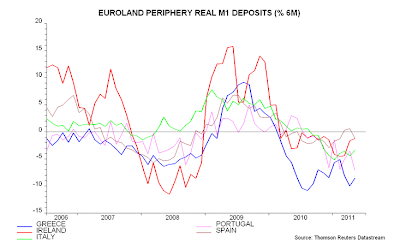 But currently, as can be seen in the above chart (which shows rates of six monthly growth) real deposits have even started to contract in the core, while in Italy the rate of shrinkage has accelerated considerably, suggesting that the earlier “two-speed” Eurozone recovery may now be about to give way to a period of much more generalised weakness, reinforcing the impression given by the PMI order indexes. 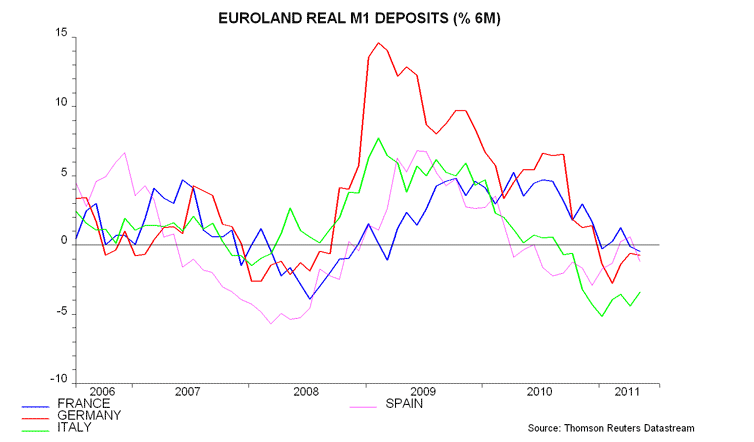 What is most striking is the way Italian M1 deposits have been contracting much more strongly than Spain’s have of late, although this development should not take us completely by surprise, since, as I have been consistently pointing out (see here, here and here) it has been clear from both real and survey data for some months now that Italy was heading towards recession again. 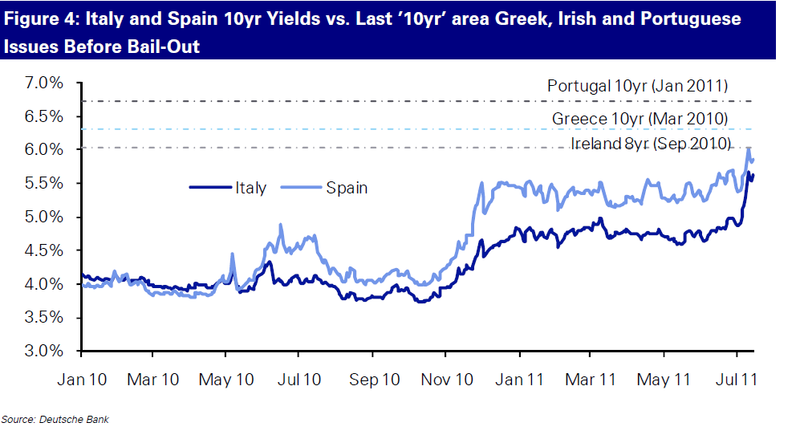 And looking at the second monetary chart that Simon provides, it is evident that the weakness in Spain and Italy forms part of a much more general contractionary phenomenon on the periphery, but then I imagine that the idea that Greece and Portugal might be in recession comes as a surprise to no one. Of course, the vulnerability we are seeing on Europe’s periphery is being played out in the context of a global economy which is itself clearly losing momentum. 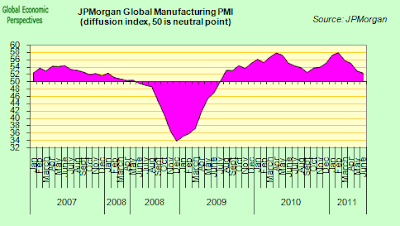 This generally weakening in global growth has been clear from the evolution in the global manufacturing PMI for some time now. 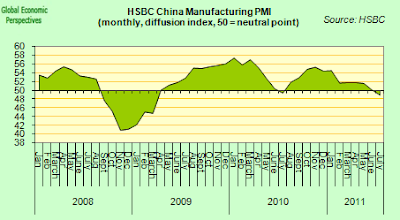 And the latest China manufacturing flash PMI (which showed contraction for the first time since the middle of 2010) suggests the ongoing pattern will be once more confirmed in July, with global manufacturing moving closer to the critical 50 dividing line which marks the frontier between growth and contraction. Even more importantly the Chinese export order component (which could be considered as a long leading indicator giving us information about possible activity levels three to six months from now) reinforced the idea that the slowdown is likely to be extended in time. 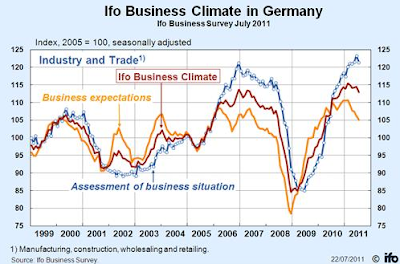 This impression (of an extended period of lower growth globally) is also confirmed by the business expectations component of the German IFO. I would about anticipating an early termination of the slowdown till we see some real sign of sustained improvement in Chinese new export orders and a solid uptick in IFO expectations. So Why Don’t We All Be Just That Little Bit More Vigilant? 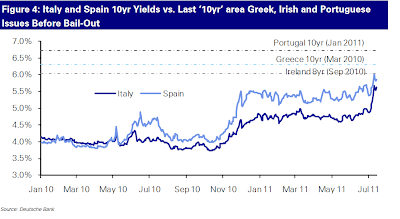 "As I've noted several times in recent months, bond market spread imply very low near-term (3-6 month) probability of default in any Euro-area country. A sovereign default is much more likely to occur near the end of the next bear market, whenever it occurs, than at the start. As Ken Rogoff and Carmen Reinhart noted in their book This Time It's Different, "Overt domestic default tends to occur only in times of severe macroeconomic distress." The most likely window for a Greek (or other Euro-nation) default will be at a point when France and Germany are experiencing economic downturns sufficient to douse the political will to bail out their neighbours at a cost to their own citizens". So in theory what these leading indicator readings should be telling us is that we should expect little more in the way of rate rises during what remains of 2011. Continuing to raise rates into an economic slowdown where there are clear risks of financial instability would not seem to be sound monetary policy. 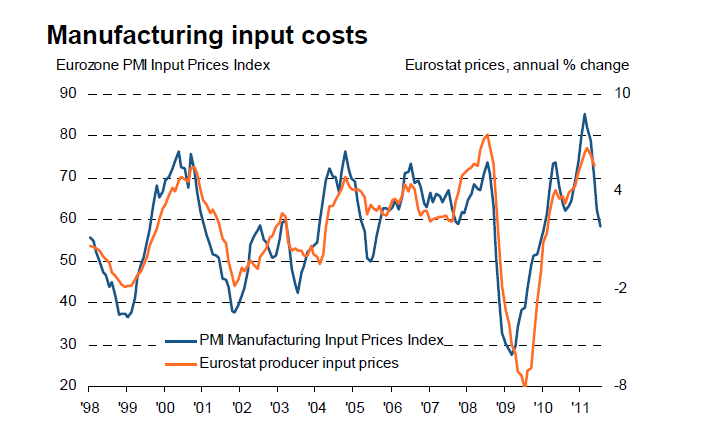 In addition, given the way the pace of manufacturing input price inflation now seems to be cooling rapidly (see chart below), it would not be surprising to see a change the wording of the risk assessment for price stability from ‘on the upside’ to ‘balanced’ at the next meeting. This would avoid a lot of potential communication difficulties in the months to come, and would open the door up to a much more flexible interest rate policy. 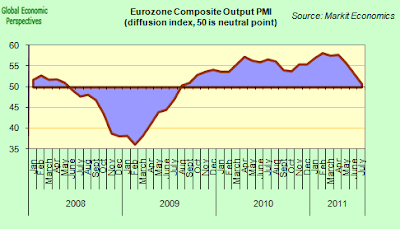 One critical point to grasp is that the ECB decisions themselves have now become one of the main factors which will influence the outcome of the slowdown, not simply via the standard monetary policy path on Europe’s core economies but via the impact its decisions will have on policy sustainability on the periphery, and though this channel on the level of global risk sentiment. In this sense ensuring economic growth is not the only distraction which could divert the ECB’s attention from its principal mandate in defence of price stability, since there is also debt stability to think about too. 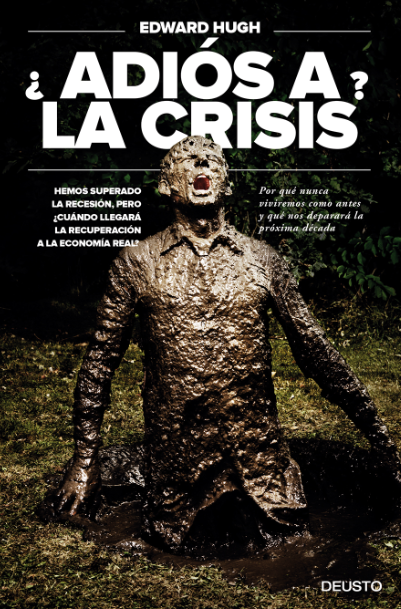 Recent days have show that large peripheral economies like those of Spain and Italy, far from having totally decoupled from the smaller and weaker countries, are now once more being drawn back into the maelstrom. In particular Italy’s government debt to GDP level of 120% has been attracting growing attention. Simple calculations show that just to stabilise debt at this level with the previous prevailing interest rates the country needed a 3% annual growth in nominal GDP. Now, of course, they are likely to need slightly more. But real GDP growth this year will be significantly under 1%, while all those earnest efforts by the ECB to push the country’s inflation rate down below 2% will simply serve to help nudge the debt level upwards, in the process raising the premium investors will ask to buy Italian debt, with the implication that next year the country will need an even higher rate of nominal GDP growth, and so on, and so forth. 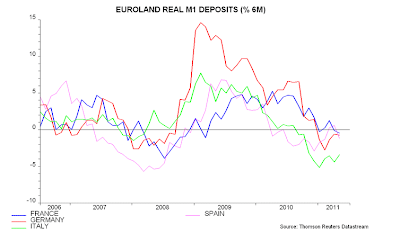 And the situation is Spain is hardly better, with 85% of mortgages being attached to variable rates, pushing Euribor upwards simply starts to weaken the hitherto comparatively robust performance of the bank mortgage books, while the slower economic growth will make government deficit targets even harder to maintain. So really, the issue is not whether the ECB was right to go ahead with this months rate rise given its main mandate, the issue is whether members of the Governing Council could by any chance prove themselves sufficiently flexible in the future to change their discourse in the face not just of Greek default woes, but also of heightening recessionary and debt management risks? In his report just before the last rate meeting, Deutsche Bank’s Gilles Moec argued that the situation was “not bad enough” for the Bank not to raise. I wonder if the deterioration we have seen since that time makes it “now bad enough”? Just how bad do things have to get for us to reach that point, and just what is prudent and what is risky behaviour in current circumstances? Certainly Council members need to be vigilant, but in particular they need to be vigilant that their attempts to avoid one problem do not inadvertently generate another, even more difficult to handle, one. Smoke On The East European Horizon? "The market is pricing these sovereigns at much wider levels than where their agency ratings would imply," said Diana Allmendinger, a director at Fitch Solutions.CDS on Italy imply a rating of BBB, five notches below its agency rating of AA-minus. And Spain's implied rating is BB-plus, nine notches below its agency rating of AA-plus. With so much emphasis being placed on what has been happening farther to the South, economic realities on Europe's Eastern periphery have largely been escaping the close scrutiny of media and analyst attention. 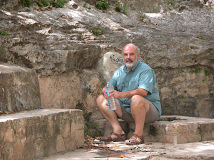 In the wake of the belated recognition of the region's vulnerability which followed the bout of acute stress experienced during the post-Lehman crisis, a new consensus has now emerged (for an in-depth study of the Latvian example see this piece) that the IMF-guided programmes put in place at the time have essentially set things, if not entirely straight then at least on the right track. In particular, as a result of the extensive fiscal discipline and willingness to sacrifice shown a much brighter future now awaits these countries well to the sidelines of all those horrible Greek debt concerns. Certainly this is the picture you get from looking at the way the ratings agencies have been treating many of the countries in the region. Only last week Fitch upgraded Estonia to A+, citing the country's solid economic growth performance, exceptionally strong public finances, declining external debt ratios and increasing stabilization in the banking sector. But since many reservations have been being expressed in Europe of late about the validity of rating assessments, I thought it might be interesting to seek out an alternative opinion, and take a look at what the financial markets have been saying, at least as far as the recent evolution of Credit Default Swap prices go. The recently upgraded Estonia, for example, was being valued as recently as just two years agao as having the third-riskiest sovereign debt in the European Union. But the country is now trading in quite another league, and finds itself included among the European "top ten" sovereigns in terms of price. As reported by Bloomberg on 20 June, Estonian credit-default swaps were trading at 87 basis points, while France was being quoted at 83.7, the Czech Republic at 83, Austria at 68.7 and the U.K. at 66, according to data provided by CMA. 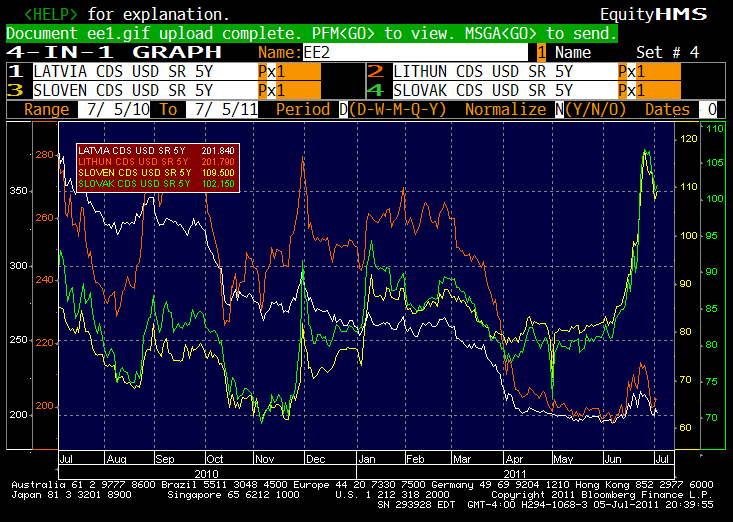 By way of comparison Polish CDS stood at 159.6. Effectively, Poland was being considered as almost twice as risky as Estonia. The big question, of course, is whether this kind of realignment in valuations make any kind of economic sense? Is contagion risk being reasonably priced in, and if it isn't, do we face the risk of a sudden (and destabilising) adjustment in the not too distant future? 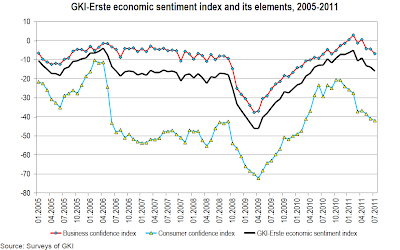 Obviously, it is clear that the Estonian Sovereign was never, even during the worst moments of the financial crisis, and under the most severe of worst case scenarios, the third riskiest that was to be found within the frontiers of the EU (Estonia was the only EU country to have a budget surplus last year - worth 0.1 percent of GDP - while public debt totaled a mere 6.6 percent). On the other hand it is the case that Estonia faced an extremely challenging crisis in 2008/09, and had the Euro peg collapsed in one of the four East European countries who had one at the time then the pressure of private debt could certainly have confronted the country with some very complex and difficult choices. So, if we all stop being emotional about CDS for a moment, and start to consider that they might be a traded instrument which can tell us not who is about to default but rather something about the perceived levels of country risk at a given moment in time then they might offer us some sort of yardstick for following how market sentiment is moving, and even (the case in point for my argument here) whether market pricing of relative risks is in line with economic fundamentals. 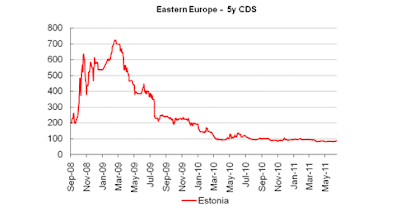 So, following the argument along a bit, it is far from clear that the current level of Estonian CDS prices risk in in any more satisfactory way than they did at the height of the crisis, since as we will see there are rather curious anomalies in the way in which some of the countries in the region are being priced, while an excessive short term emphasis on fiscal deficits has perhaps mislead observers about real risks in Europe whether these lie to the South (Italy) or to the East. 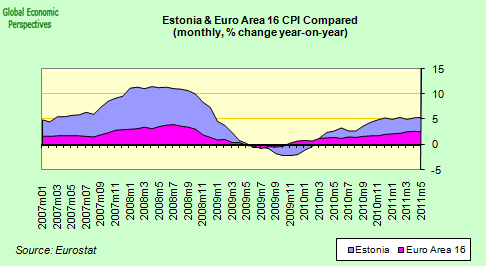 It is not my intention here to single out Estonia for special - negative - treatment (that would not be warranted) but the value being placed on the CDS really is incredibly low for a country that just entered a Euro Area whose outlook could, at the very least, be considered as reasonably uncertain. It is being priced as part of core Europe, when in reality it forms part of Europe's periphery. 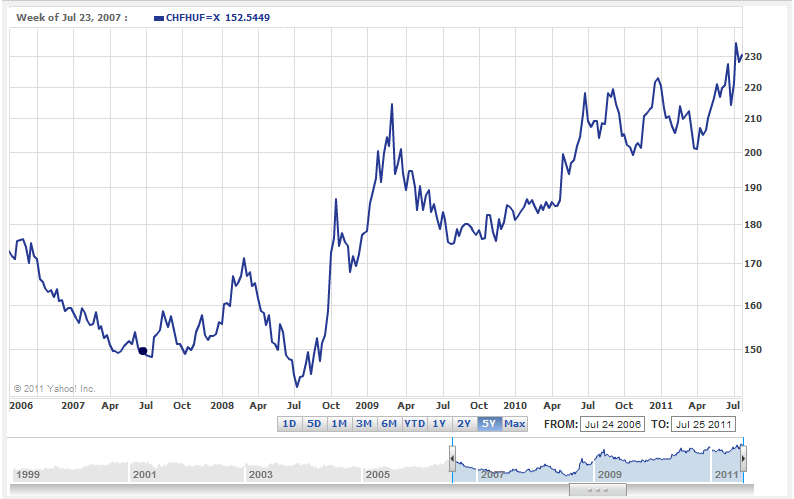 Arguably, were the Euro to break in two, Estonia would incline towards riding with the German lead group, but given the fact that the country now has a totally export dependent economy (this is the part that I feel is least understood) , and a currency which was arguably over valued at the time of Euro entry (and the country now has ongoing above-Eurozone-average inflation) it is not clear how prepared the country would be to handle the challenges of being attached to the new, and ultra-high value, currency which would be created. Of course, some are going to argue that the risk of this happening is slim, but is this risk, small as it may be, currently being priced in? That is the question. I suggest it isn't, and this creates the possibility of a dangerous surprise in the markets in the event of a disorderly Greek default. Strangely, as a country which has recently entered the common currency, country risk seems to have followed a path which is rather nearer to that of its Baltic peers that equivalent Euro Area countries. 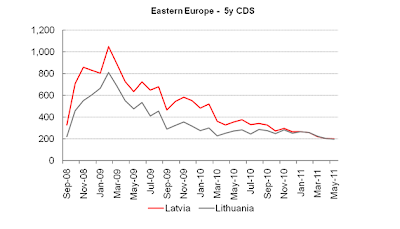 This disparity becomes even more striking if we look at the evolution of Baltic CDS with those of the two countries in Eastern Europe who entered the Eurozone before Estonia. The spread on Slovenian and Slovakian CDS has surged in recent months, not because short term risk of sovereign default in either of these two countries has increased notably, but simply because these two countries as members of a Eurozone with known problems, and real contagion dangers, are now seen as being more risky. So why isn't this the case with Estonia? True Slovenian and Slovakian CDS are still comparatively low risk priced (Slovenia at 109 and Slovakia at 102) but it is the direction and velocity of the movement which is striking, and especially in comparison with Euro Area peer Estonia. Why are these two countries considered to be more at risk than Estonia, especially given the size of the latter's recent historic legacy? Moving beyond the Baltics, risk in a number of other East European countries seems quite mispriced, unless we think that only being pegged to the Euro (rather than actually being a member of it) is a less risky mode to live in. Bulgarian CDS (currently around 225) have been steadily moving down all this year, and in sharp contrast to what happened in June last year, have so far not responded to the Greek crisis, despite the fact that Bulgaria's banks are quite dependent on their Greek parents for funding. The picture in Romania is rather similar, with the current price of 250 being well off last years highs of around 415, which means that markets are currently perceiving risk in Spain and Italy as more pronounced than those in Bulgaria and Romania. Certainly I would not want to argue that risk in both the aforementioned countries is high, but I am not at all convinced that contagion risk in the latter two is anything like as low as is being suggested, which is presumably why Nomura was recently advising clients in a research note to sell South African CDS and buy the wrongly priced Bulgarian and Romanian ones (also see here). Looking at the macro economic fundamentals of the respective cases, I can't help feeling that in this case the analysts are right. And if we move over to Hungary, then we find that as of last Friday CDS stood at around 285, well below the highs of over 400 seen as recently as last November in the wake of the Irish crisis. Arguably the Hungarian case is the most glaring one, since it is the East European country with the highest debt to GDP levels (around 80%) it has very high gross foreign debt (around 135% of GDP, of which 45% is forex denominated), and it is a country where institutional quality is a constant cause for concern. In many ways Hungary is the Italy of the East. Apart from the presence of a strong trade surplus there is not that much to commend in Hungary's recent economic performance, yet its CDS has fallen into line with a regional pattern, and there is little in the way of what is happening in Spain and Italy to be seen in the spread, let alone what is going on in Slovenia and Slovakia. Both Hungary and Romania were the object of IMF/EU rescues during the height of the financial crisis, and as a result their financing problems subsided. Both countries have made substantial progress in reducing their fiscal deficits, and have carried out a number of structural reforms. But both countries still have high levels of external indebtedness coupled with economies which are now extraordinarily export dependent for growth. In addition the demographic outlook for many of these countries is absolutely dire, and you will continually have smaller and older workforces trying to pay down increasing quantities of debt. This underlying reality constitutes an unstable combination which make the countries concerned highly vulnerable to both a renewed deterioration in sentiment and an external economic slowdown of the sort we could see following a disorderly Greek default, and yet markets in general seems to be shrugging off the risk as almost non existent. "Smoke on the horizon" the admiral said as he lowered the telescope from his blind eye, "I see no smoke on the horizon". Can Italy Grow Its Way Out of Debt?